As someone who plays poker regularly, I'd like to think that I have a good understanding of why luck is important in our lives. It's NOT because the world is completely random and we have no influence over what outcomes will materialize for us - actually, it is the very fact that we do make meaningful decisions in the face of uncertainty that generates luck. Let me try to explain what I mean with an analogy to the game of poker. Poker is a game of skill, which means those players with superior skills (patience, discipline, memory, critical/logical thinking, mathematical analysis) have a long-term edge over the less skillful among them. It is a very simple game with simple rules governing what each player can do (fold, call, bet, raise), what order they can do it in, how much they can bet at any given time, which hands rank higher than others, etc. So those players who are the best at incorporating all sources of information and making the most profitable decisions at any given time have a clear advantage in the game and should make plenty of money in the long-run. But they will still lose A LOT of hands, regardless of how skilled they are, because they can never know exactly what cards will come out and they rarely ever know exactly which cards other players are holding (unless they are cheating). Even the best poker players in the world are required to have losing hands and losing sessions. That is what luck really means - natural variance in a probabilistic setting. For example, a very good player will get his/her money in the middle with AA (the best starting hand in Hold Em') before the flop, have an 80% advantage over another player with a lower pair, and will still lose that hand - it is inevitable to occur, and most likely will happen many times. 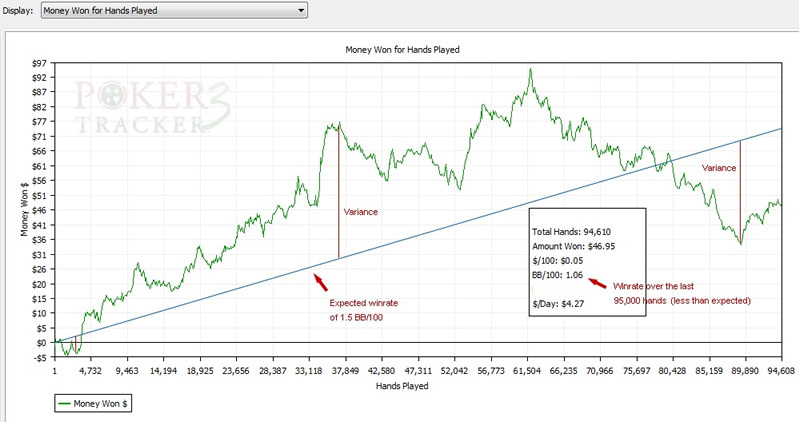 The following graph illustrates the concept of variance in poker. It shows the expected winrate of a certain poker player that has an edge over the players he is up against, and then graphs his actual winnings on top of that. We can assume that this player maintains a consistent style of play, always plays the same stakes against very similar opponents and never deviates from his basic strategy of maximizing value with his winning hands, and minimizing losses with his losing hands. As you can see, the inherent variance (luck) involved led him outperform his expected winrate for almost 80,000 hands, and lost almost 50% of his max winnings accumulated over 60,000 hands after playing another 30,000 hands. Eventually, we can expect his actual winrate to converge near his expected rate, but there is no way to predict how it will take before that happens. Now, what happens when we stop talking about poker and start talking about life in general? The latter is obviously a much more complex "game" with many more rules, many more players and, therefore, many more combinations of "starting hands" and possibilities for how the action will unfold in the future. What that really means is that the variance (luck) involved in life is much higher, regardless of how talented or skilled a person happens to be. This variance, which, in poker, is eventually smoothed out after enough hands are played, could last the better part of a person's entire lifetime, or even across multiple lifetimes (parents, children, grandchildren, etc.). That is especially true for those who are born into conditions of extreme poverty, since they are dealt hands that have very little chance of winning in the first place. While every player at a poker table has an equal chance of being dealt AA in any given hand, that is not true for the players in the game of life. The potential hands a person can be dealt in life depend on where they were born, when they are born, who they were born to, what race they are and a multitude of other factors. They may learn certain specialized skills over the years, and become very good at utilizing those skills in various settings, but that still doesn't mean they are guaranteed to be long-run monetary winners. In fact, they still have to avoid an abundance of variance for those skills to ever shine through. They must find a way for almost every single decision they make to work out favorably, such as decisions on where to live, how much official "education" to get, what jobs to apply for, what hours to work, what types of insurance to buy, what type of car to drive, etc., etc. Even if they make all of the most optimal decisions at the time, new circumstances could render those decisions completely worthless. Are Poor People Lazy? Or Just Lucky? Somewhere along the line, everything got turned upside down. It used to be that we envied the rich for their wealth, but now we pity them. For it seems that no one works harder than a millionaire (except perhaps a billionaire), which is why we must do everything in our power to help them keep every penny that comes their way. At the same time, we envy the poor, those lazy lucky ducks who just sit around all day, collecting unemployment, avoiding taxes and living it up on food stamps. Read Ruben Bolling’s latest cartoon starring Lucky Duck. It wasn’t always this way. Once, not so very long ago, people saw the world as it really was. We all knew that the rich have it easy while the poor have hard times. Indeed, that’s the main reason people want to be rich instead of poor. Plowing fields is work. Caring for children is work. Building houses is work. Studying is work. Mopping floors is work. Brain surgery is work. Waiting for the bus that will take you and the kids to day care before catching the other bus that will take you to your job is work. Cashing your dividend check is not work. We pretend to honor hard work, but our policies deny it. If we honored work, we’d remember that most of the hardest-working people in our society are also the lowest paid. Many of the hardest jobs come with no paycheck at all. Conversely, some of the best-paid people hardly work at all. Most investors, for instance, don’t work hard (unless you count unproductive sleepless nights), because their money does the work for them. Many highly paid professionals — investment bankers, doctors, lawyers, athletes and corporate managers — do work hard, but do they work any harder than the people who pick the crops, or who work on the assembly line, or sit up with a sick kid all night? Poor people — with few exceptions — are not lazy. Many of them have retired after a lifetime of hard work. Many of them are children, with a lifetime of hard work ahead of them, if they can learn the necessary skills and habits. Many of them work a job, or even two, but a minimum-wage paycheck isn’t enough to pull them out of poverty. And many of them work hard in exactly the same sense that Ann Romney has worked hard her whole life. It’s not effort that separates them from Mrs. Romney; it’s luck. There’s no doubt that success rarely comes without hard work. But there’s also no doubt that luck plays a large part in our successes and failures. The poor are indeed lucky ducks. It’s just that all their luck is bad. Indeed, luck (variance) works both ways. A poker player who is getting his/her money in bad almost every hand will eventually go on a "hot streak" and win most of those hands. Poor people who are severely disadvantaged from the beginning will eventually be at the right place, at the right time and in the company of the right people who help launch them into material prosperity (or perhaps they will just hit the mega-million lotto numbers). Those are exceptions to the rule, though, and, in the long-run, the system makes sure that a large majority of otherwise talented people are kept somewhere between a range of heavy losses and barely eking out a profit. The rules of the financial capitalist game make it so that only those players with a very narrow set of skills will be guaranteed success over and over again, which just so happens to be skills geared towards bending and breaking the rules whenever it is convenient, and escaping any punishment for doing so. A person caught cheating in a poker game will be banned from the game, at best, and beaten into a bloody pulp, at worst. Not so much for the tiny group of elites who cheat the other players on a daily basis. They have privileged access to a wealth of information about other players, and many times they can even dictate exactly what cards will come out. Well, that last statement isn’t entirely true. Our complex and evolutionary "game" that comprises the totality of human material experience is a system that is ultimately unpredictable, probabilistic and filled with imperfect information, just like any old poker game. Even the most powerful elite cannot predict exactly what outcomes will result from their decisions; exactly how others will think and react; exactly how lucky others will get. There is a moment in time at which every poker player, and especially those who have been winning for so long that they scarcely remember how to lose, will confront the inevitably of bad luck. It is usually at this moment when they lose all psychological composure and are led down a winding path towards their eventual undoing. © 2012 Copyright Ashvin Pandurangi to - All Rights Reserved Disclaimer: The above is a matter of opinion provided for general information purposes only and is not intended as investment advice. Information and analysis above are derived from sources and utilising methods believed to be reliable, but we cannot accept responsibility for any losses you may incur as a result of this analysis. Individuals should consult with their personal financial advisors.